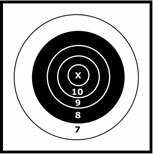 Your barrel should be free of all lead and contaminating elements prior to taking your very first shot in a match. How do we “get the lead out” and what do I mean by “contaminating elements”? By contaminating elements I mean petroleum-based lubricants, a different brand of bullet lube (other than X-Ring Lube), powder residue remaining in the barrel, a build-up of plastic or gasket material (wad) residue, or carbon missed in prior cleanings. I start by heating some water on the stove until it is very hot but not boiling. Then I open (or in the case of a Sharps, I remove) the breech block and insert a funnel with tubing slightly smaller than the inside of the chamber (but will fit the small end of the funnel) and I pour all of the hot water through the funnel and out the front of the barrel. I then take a fiber brush and wrap a patch around it so that I can push it into the barrel (from the breech end) and have it project about half its length (nylon brush) out of the muzzle. I then thoroughly shake up a bottle of Rem-Clean or Gold Medallion and soak the exposed portion of the patch and nylon brush with it. I run it back into the bore and out half way, and again soak it with the cleaner. This time I run it back and forth the full length of the barrel about 10-12 times ending with the entire brush and patch protruding from the barrel. I then take a clean patch and run it thru the barrel. Repeat the above and end with two clean patches individually run through the barrel (or until all trace of cleaner is removed). Make sure the breech and chamber area remain free of cleaner. Also wipe your cleaning rod often when cleaning the barrel. Now we are going to “condition the barrel” for the match. Make a dummy round without a primer, (I use a jacketed flat nose bullet in a nickel plated case), insert it into the chamber and close it. Take a nylon bristle brush and wrap it with a patch that you have coated with X-Ring Lube and coat the bore from the muzzle being careful not to touch the sides of the muzzle. You will bump the flat nose of the dummy round (which should have a hard crimp to hold it in place). When you do, simply reverse direction. This dummy round will insure that you will not get any lube in the chamber where it can cause a problem. Your first fouling shot will be shot over X-Ring Lube and will “condition” your bore for successive shots. You will have less fouling than if the above conditioning was not accomplished.